Light Emitting Diodes have opened up the word to endless possibilities of energy saving hand held flashlights. One of the greatest inventions for any type of lighting system that is currently available. A diode is a semiconductor with a junction of two materials that emits light. They are inexpensive to make in large volume manufacturing production lines with modern machinery. As technology improves with LEDs you will find longer life, lower energy consumption faster switching and more programmable features that are starting to improve the flashlight and optical illumination industries. The technology is advancing and is becoming widely accepted for designers and engineers alike for making smaller, more durable LED lights. We here at Simon Flashlights have slowly been improving a variety of optical hand held LED flashlights for consumer use. The goal is to make more affordable LED flashlights that can be powered by the most commonly available AAA batteries that anyone can purchase directly of the shelf from any hardware, grocery, liquor or drug store without having to purchase hard to find or special order batteries off the web. 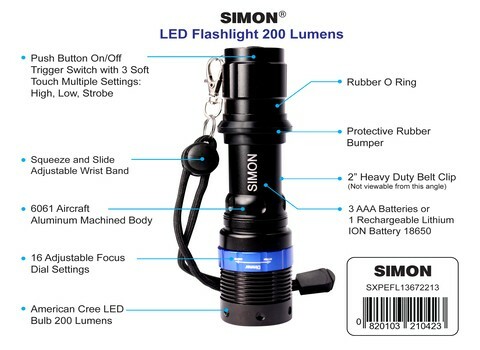 The first generation Simon Cree LED flashlight XPE puts out a strong 200 lumen light measured from the chipset itself. This is low watt flashlight is made from a 6061 grade of aircraft aluminum with sixteen dial focus settings and three modes of illumination: high mode, low mode and strobe mode. It stands a little over five inches tall and is a little larger than 1.50 inches wide at its largest girth. Its rugged good looks and ageless style comes from its big brother. The original Simon Cree T6 Pro that was designed by law enforcement as a small handheld flashlight that does multiple functions that can be abused and used as a backup light for shotgun or rifle mounted specialty led flashlights. This Simon Cree LED flashlight XPE is great dog walking flashlight or better yet to take on trips or just to store in your car, truck, boat or RV. You will be surprised how often this small flashlight will come in handy. The flashlight is more affordable than you think! Made from the highest quality aluminum, its always in stock and ships today! ONLY $ 25.00 usd. I’m looking at your ST6 vs SXPE on Amazon and wondering what the differences are. I understand they have different LEDs with different maximum output (500lm and 200lm). At the same light output setting(lumens), maybe T6 on medium and XPE on high, which one will have longer battery life? The life of the battery with the T6 on Medium and the XPE on High are almost the same on continue use within 5 minutes of run time. That being said the T6 has beat out the XPE about 55% of the time.